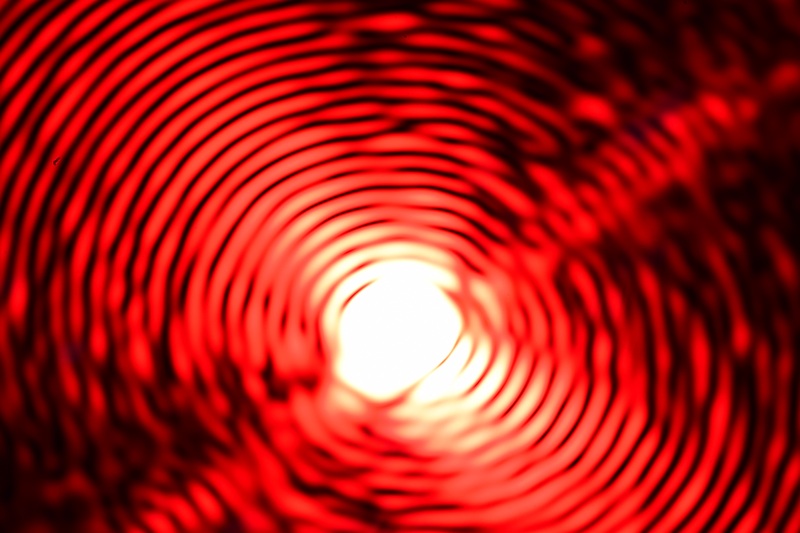 The question of interference patters is central to light theory. I would like to share some pictures that show the same patterns in very unusual situations. The first picture has been taken with the open body of a digital camera, and a laser beam a pen) shining into the body. As you can see, the same patterns appear that are usually associated with constructive and destructive interference see in the double slit experiment, or in the use of two thin plates showing so-called Newton rings. OK, back to Alice's mission. Her plan has changed a little and she will now first stop in the region of Alpha-C (AC) for some observations. It is way too late to achieve the rocket braking at the original very low (0.075g) acceleration, so Alice asked her INS computer to get them into a 'parking' orbit at a more comfortable 1g retro-burn. Her INS and my trusted spreadsheet 'know' that at -1g, it will take 0.69 years to get the coasting ship to zero velocity relative to Bob, and that it must start to brake 0.2 lyrs (on their rotated map) short of the parking position. At just over 11 years into her mission, Alice comes to rest in Bob's spacetime structure again. This is a "whiteboard dump" for a post following on part  of a Philosophy of Science thread with the above name. I have thought to move things deemed too technical here for reference (As sort of Appendices). BurtJordaan » 04 May 2017, 11:44 wrote: That said, in the next piece we will make Alice turn around en head home, and provided that her long-playing rocket has enough fuel left, make it little swifter.